Ayurveda, the holistic medical system understands living body in its own unique way. 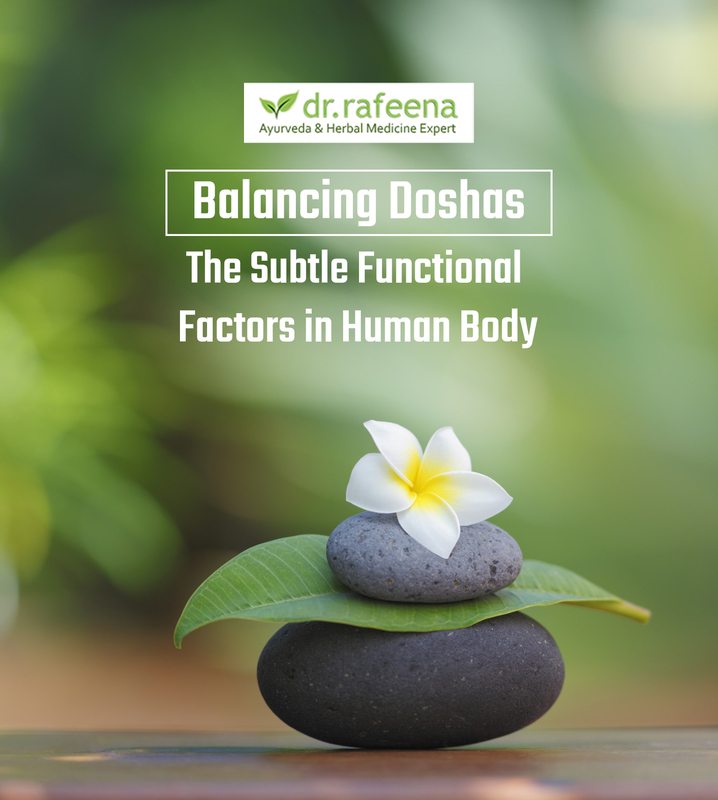 The subtle functional factors in our body are collectively called as doshas (humors). They are air factors (vata), fire factors (pitta) and water factors (kapha). Vata involves functional factors responsible for control (e.g. nervous messaging) and movements. Pitta involves all functional factors responsible for heat, acidity and transformations in the system (enzymes, hormones, etc) and kapha involves all factors responsible for stability and support (extracellular fluids, synovial fluids, etc). Even though doshas share some common attributes, they are quite different to each other. So there should be a harmony between them to ensure smooth functioning of the body. That means when doshas are balanced, they ensure health and when they are imbalanced cause diseases. Even though they are independent factors, they work together and carry out very complex activities which are sometimes opposite to one another. So if one of the doshas is disturbed, its functions are disrupted and then other doshas are also disturbed, leading to a disturbance in the whole system and eventually diseases. For example, digestion is the process of dividing food into absorbable nutrients and waste. The nutrients are absorbed and assimilated by the body and whatever remains in the food is considered as waste and eliminated timely. Food is divided into absorbable nutrients mainly by digestive juices which contain enzymes and chemicals (which come under pitta-the fire factor). In order to carry out this function smoothly, food should be mixed with the digestive juices by the movement of the gut, and once the digestion in a particular part of gut is finished, the food should be moved to the next part of gut where further digestion and/ or absorption will happen. If the movement of gut (which is a vata/air factor function) is too quick or too sluggish the process of digestion will be disrupted. The process of digestion and these movements are quite intense and the mucosal lining of gut (which is a kapha/water factor) helps to protect the wall of gut being damaged from digestive juices and other factors. Now we can see that the actions of digestive juices, movement of gut and mucosa of gut should work in a balance to carry out digestion smoothly without damaging the wall of gut. This is the case of any metabolism happening inside the body. So in order to maintain health it is important to keep the doshas in balance. Doshas are present throughout the body, all the time. They do same functions in all individuals. Still according to the condition of doshas in fertilization factors, one or more doshas slightly dominates from person to person. Our body is accustomed to this variation and it doesn’t lead to any pathology. Instead this variation gives unique characteristics to our body and mind. It remains same throughout our life. It is called prakruti (Ayurvedic body type/ body constitution).One of the important steps in maintaining one’s balance of doshas is to understand their Ayurvedic body type and adjusting lifestyle accordingly. So in order to be healthy we have to choose our lifestyle and diet in a way that it supports the balance of doshas.Ayurvedic daily regimes ,Ayurvedic seasonal regimes and life style choices according to body type are aiming to balance doshas so that we enjoy health consistently.